We are currently living in Torrevieja, Spain which is surrounded by two beautiful natural salt-water lagoons, the de La Mata and the Torrevieja. These two very large lagoons have been declared natural reserves which mean they receive protected status from the government of Spain, and are considered Europe’s largest salt lakes producing in excess of 800,000 tons of salt a year. These lakes are also home to over 200 species of migratory birds including the pink flamingo. Salt has been extracted from this area as far back as the 15th Century and may have helped to fund the travels of Christopher Columbus but mass salt production began in earnest around 1802. The salt produced here has been known to help lessen the severity of such medical problems as arthritis, asthma and rheumatism and this area is regarded by the World Health Organization as having one of the healthiest climates in Europe which helps to explain the large number of expats who vacation and retire here. 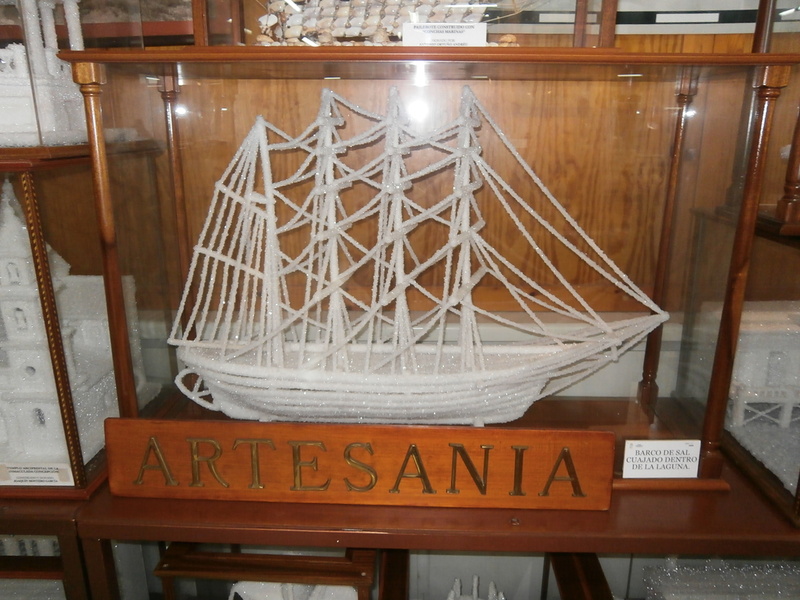 One of the unique things to happen here in Torrevieja is the making and selling of ‘salt crafts’. Artisans build models and forms to create these amazing works of art. These pieces are then submerged in the salt lakes during the months of May and June when the salt concentration is highest and it is the time of ‘setting’. It is during these months when the days are longest and evaporation rates are at their peak which aids in the crystallization process. Salt concentration is so high that these pieces only need to be submerged for three days and when removed they have been completely crystallized in salt. 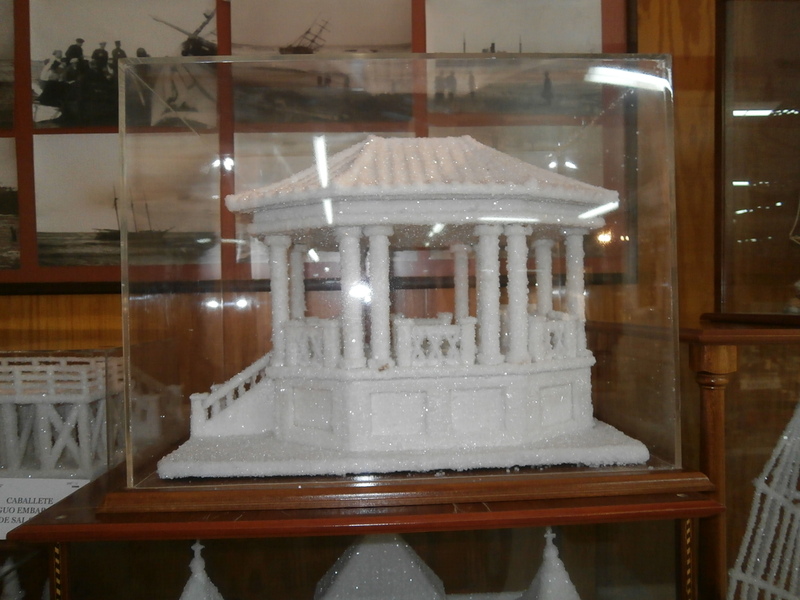 These salt crafts are highly prized and considered valuable gifts and of course real works of art. 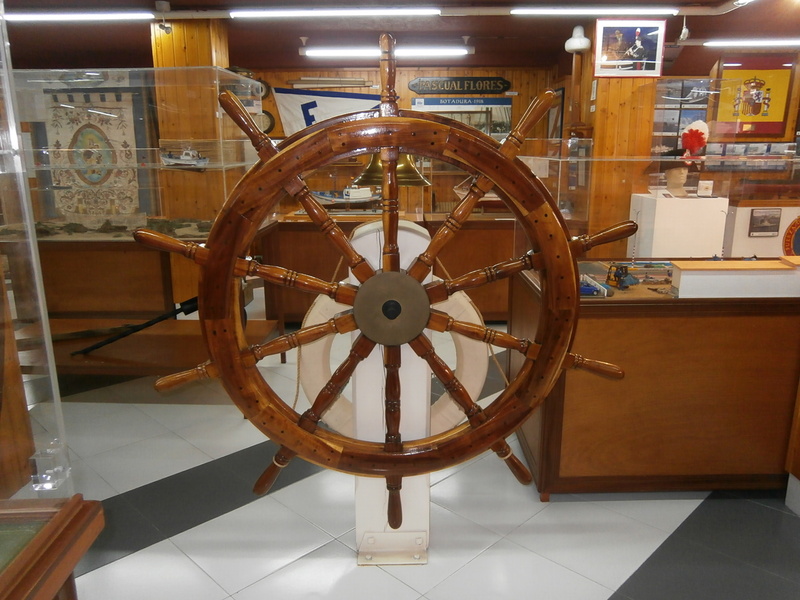 Since salt production is such a big part of the history of Torrevieja there is a Salt Museum which has quite a nice collection of items pertaining to life in Torrevieja and of the salt production. It is worth a visit when touring around the city. So the next time you have occasion to ‘pass the salt’ or to throw rock salt on your driveway think about where that salt might have come from. 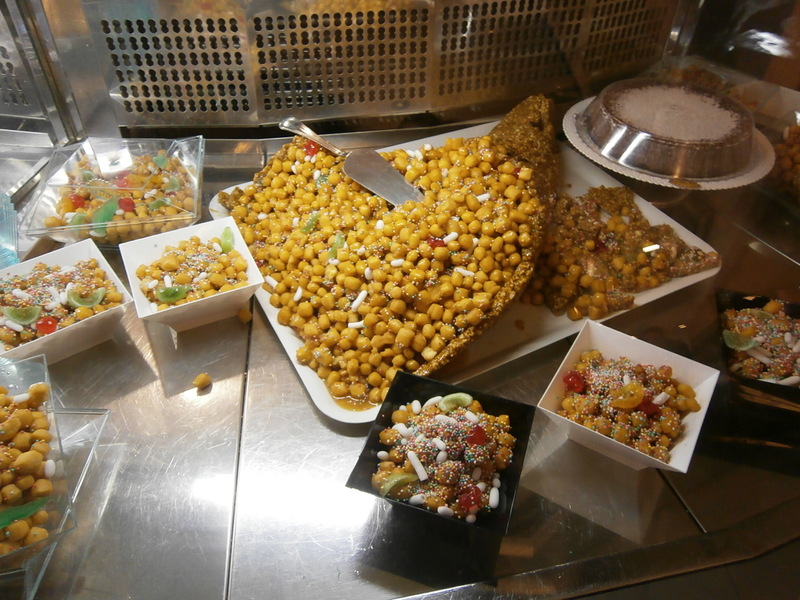 The package might have been bought at your local hardware or grocery store but the salt might have come from some far away place, just like Torrevieja. We love watching the news channels while in other countries. They really cover world events; not just events within the shores of the US. They cover all the civil unrests; all the real life and death issues in every country and all the real people that are news makers. The news told on foreign television and even in foreign newsprint is vastly different from the news told on the US airwaves. They tend not to deal with tabloid news in other countries and most people here don’t care and don’t know what is happening with Justin Beiber, anyone named Kardashian, or any of the other people out there who have a name but no talent. Yes, they have their tabloid rags and the scandalous photos that go in them but everyone knows they are tabloid rags and they have zero credibility and zero power. In the US powerful people and even Hollywood wannabe’s all want their name and face to appear in as many of these rags as possible. One of the things this centrist attitude has done sadly is that American’s don’t look outside of their own country to find noteworthy news. And I’m here to tell you, people outside of the US don’t care all that much about what the American people think is the best movie or the best fashion or the best car or the best anything. American’s do not make the world go round. Just the other day these three stories reached out to me and highlighted how different the news is sometimes in a foreign country and what they deem to be important. 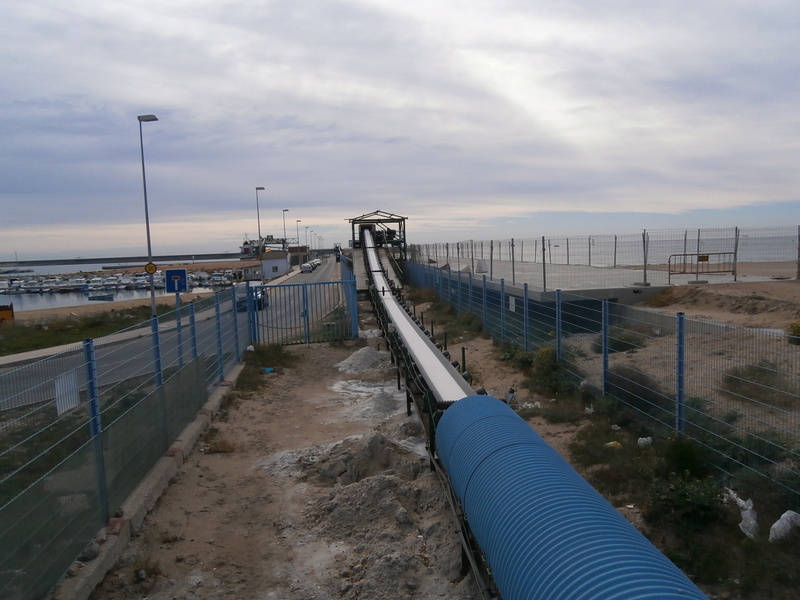 First story let us know that over 30,000 tons of road salt was headed from Torrevieja, Spain via barge to the eastern shores of the US. You see the US does not make all of the road salt that it needs in order to keep its roads salted during the winter, and its most likely cheaper to ship the salt from a foreign country instead of getting it from within the US. I’m going to bet no one in the US ever saw this story. I have to admit even I was shocked to learn that road salt was actually imported from foreign countries. I had no idea that we didn’t produce enough within the shores of the US to take care of everyone’s needs during the winter. Next story dealt with the vast amount of motor homes that dot the landscape here in Spain. People are driving in from all the other countries to live here in Spain for a while and they are filling parking spaces at the mall, in the streets lining residential neighborhoods and setting up home for free. It is making locals crazy because they have no place to park when they go to the mall to shop. Yes, there are RV camps here in Spain; reportedly nice ones with all the amenities; but cash is tight and sometimes the people driving here don’t have the money to spend at the local camp ground. If you don’t think this story deals more with how locals feel about tourists and how they affect the everyday life here and peoples dislike of these motor home residents then you need to get a passport and travel more. You can rent these motor homes as well as drive them into the country and no one knows which is which. Therefore, if you do decide to travel here and you rent a motor home and then you get treated badly by the locals there just might be a reason they treat you like you have the plague. When you sit down to watch the national news tonight know that somewhere we’ll be watching too. But we are watching the growing civil unrest in the Ukraine and Venezuela, and the demonstrations happening in Santiago, Sarajevo and Barcelona. We are not watching Hollywood wannabe’s and who is sleeping with whom or reading more about Simon Cowell and his newborn baby that he had with his best-friends wife; and we don’t care about anyone named Kardashian, Ritchie, Duck or Trump. I have been traveling internationally since the early 1980’s. In my time traveling meant visiting new places and meeting new people. Today the hot thing to do is to vacation. Vacationing is where people land in a foreign country and take up residence in an All-Inclusive resort. They never have to leave to eat; drink; swim; be entertained, basically they don’t have to leave for anything, and they don’t. The only thing they have done is have their passports stamped. They then show this stamp to family and friends and tell them that they have visited a foreign country. Knowing this I always ask people where they visit and what they saw when they landed and if they can’t give me real stories about real people I know they just vacationed and did not travel. And yes, their credibility with me goes way down. People vacation because they think it’s safer to be in these all inclusive resorts. I get that. But if you are going to voluntarily imprison yourself behind walls why not do that within your own country? Why fly somewhere when you can find a five star resort right in your own backyard? You aren’t seeing any of the foreign country you are in anyway so why bother? Your own country most likely has beach’s and five star restaurants and five star hotels where you can make spa appointments and hair salon appointments and more of what goes with the pampered lifestyle. You don’t have to learn a foreign language to get by either. I don’t get why people fly somewhere foreign to sit at the pool or to eat the same food they can get at home for an additional cost. If you have that much money to waste I’ll give you my bank account information and you can make a deposit anytime. Okay, not a surprise that I’m not a fan of these All-Inclusive resorts. They stop people from really getting to meet and see another culture and country. I didn’t get my passport to have stamps placed in it to show family and friends all the places I’ve been. I got a passport to meet the people of the world and to experience what this planet has to offer. All those pretty pictures that are in guide books and in National Geographic I want to see for myself. Happily there are people who travel to travel. Mike and I meet them everywhere we go. So stop vacationing and really start traveling. There is more to see and do in every country than can be found behind the walls of an all-inclusive resort. If you are not comfortable with this idea then just stay within your own countries border but stay at those spectacular five start hotels and beautiful beach’s and fancy restaurants in your own cities or even in another state. At least you won’t be behind prison walls, which is no way to spend your hard earned vacation. When I was growing up March 19th was always a big deal. I never understood however why it wasn’t a day off from school since it required hours of work to get ready for the food feast that was coming but my Mom took care of most of the cooking when I was younger so I just had to show up at the dinner table. March 19th is the day Sicilians celebrate the Feast Day of St. Joseph and how better to do this than with a St. Joseph’s Table. Because March 19th happens during lent this is a meatless feast but some of the best foods are prepared this day; baked and breaded eggplant, stuffed zucchini, egg with asparagus frittata, stuffed artichokes, fava bean soup, and bread, lots of special and sometimes sweet breads to eat with your meal. Mostly it’s the desserts we can’t wait for. Sfingi’s filled with custard, fravioli’s filled with honey sweetened rigotta, pignolatta’s smothered in honey, and more. Not only did I learn to love them all I learned to make them all as well. Pure heaven. A little background perhaps is needed. St. Joseph was the earthly father of Jesus Christ. His feast day, and birthday, is March 19th. St. Joseph is the patron saint of workers; he is the universal protector of the Catholic Church and is the patron saint of Canada – China and Mexico. March 19th is also celebrated as Father’s Day in countries such as Poland, Spain and Italy – and in some countries St. Joseph’s Day is a National Holiday. During the Middle Ages there was a drought in Sicily and the people feared a famine would come. They prayed to St. Joseph to intercede on their behalf and stop the famine. They promised that if he answered their prayers, they would prepare a large feast to honor him. The rain did come, and the people of Sicily prepared a large banquet for their patron saint. The fava bean was the crop which saved the population from starvation and is a traditional part of St. Joseph’s Day. 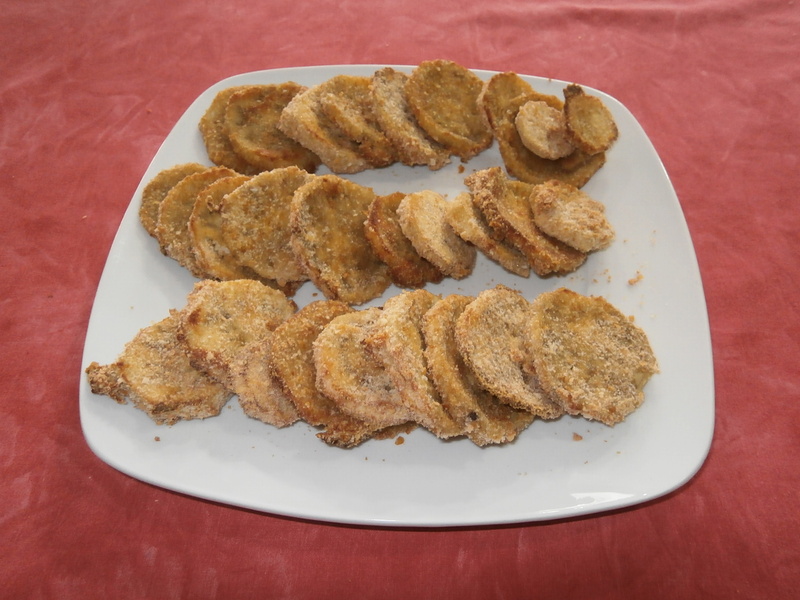 Foods are traditionally served containing bread crumbs to represent saw dust since St. Joseph was a carpenter. Most times our ‘table’ was the sight of no less than 50 people coming over to feast together. Since I was born and raised in Buffalo, NY and I had a very large Italian American family base we always had a lot of people over to celebrate this day with us and it was one of those special days I always looked forward to. 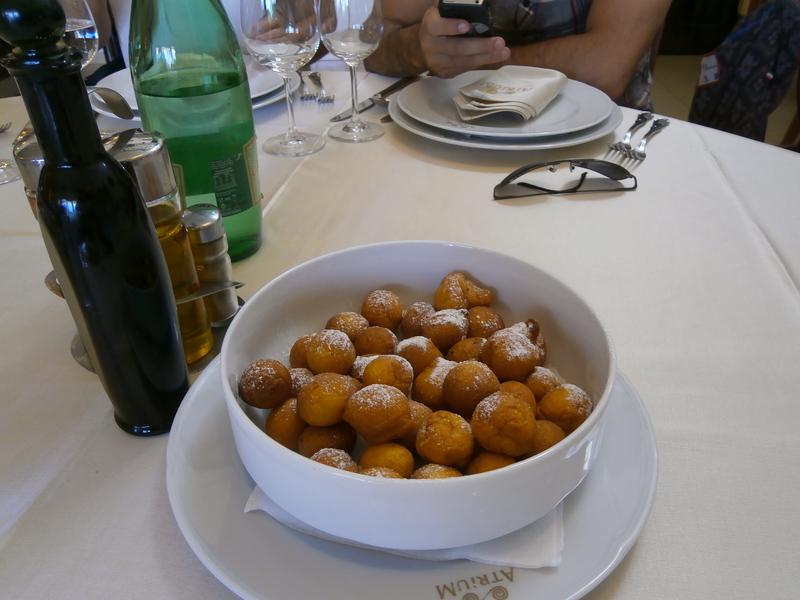 The funny part was that I was told growing up that Sicilians were the only group who celebrated this day with a feast. Now as I travel the world I have come to learn that this is not the case and many cultures and other ethnic groups celebrate this feast day as well. For instance, here in Spain the famous Cathedral Sagrada Familia was actually first designed and created as a tribute to St. Joseph. It evolved during Anton Gaudi’s time to become more than this but the original plans were based as a tribute to Jesus’s earthly father. As time has gone on my parents have moved away from Buffalo and my folks go to a St. Joseph’s Table held every year at a local church in downtown Los Angeles. The table is packed with people who come to participate in an Italian feast, some who know what day it is and others who just know that the Italian church is having an awesome dinner and they want to eat well this day. I love to travel. What I love more is having common ground with people. I also love sharing my knowledge with others where I know what makes March 19th so special. I have been able to tell our hosts here in Spain about St. Joseph’s Day in the US and they are surprised that such a tradition exists; it is something they were not aware of; that Italian Americans celebrate this day as they do. They were impressed. It’s like I’ve always said; sit different people from different cultures around a dining room table and the differences between us seem to disappear. We really have more in common with each other than people realize. Now if only our world leaders would sit around a dining room table and talk; maybe the world wouldn’t be filled with so much distrust and hate. At least that’s my prayer, and hope, for the New Year on this March 19th. That and may your tables be filled with good and plentiful food all year. Side Note: St. Joseph’s Day is also the day when the swallows traditionally return to Mission San Juan Capistrano after having flown south for the winter. I don’t own anything green in color anymore to wear on St. Patrick’s Day. I don’t have red to wear on Valentine’s Day and I don’t have pastels to wear on Easter. We have downsized so much that we don’t have special clothing in special colors that we would wear only one day a year. Life is very streamlined now. If it isn’t practical we don’t carry it or pack it. I used to have a pair of Christmas themed earrings for every day of the month that I wore from December 1 to 25th. I would wear a different pair every day to work and everyone loved it. I don’t have those earrings anymore. They went to charity long ago and I haven’t missed them. In fact since I don’t carry any jewelry with me my ear holes have closed up and I don’t think I could wear earrings anymore anyway. We have downsized so well that everything I used to have that pertained to holidays is gone. I used to have boxes and boxes of items for Halloween (my favorite holiday!) and Christmas. Mike and I would move 25 or more boxes filled with holiday stuff every time we moved. It was hard to give up my Halloween stuff. I had some great decorations but I realized that I hadn’t even taken them out of their boxes in the last few years that Mike and I were in the US so why was I moving them from home to home? It’s also sometimes hard to keep up with all the days off people get in every country. We see family and friends back in the US talking about their long weekend on Facebook and we scratch our heads and wonder what the holiday is that they have a long weekend for. In fact we don’t really celebrate any of the nations ‘holidays’ like we used too and we don’t even know when they are really. We walk the streets in some of the countries we live in and find shops and cafes shuttered on days when they are usually open but because it’s some holiday or festival time they are closed. These slippery and slimy individuals still exist. They are not gone like the five and dime alcohol cough syrups they used to sell. If you don’t know the term ‘snake oil salesmen’ you are most likely the wrong generation which means you are not their target audience. Today they try to sell Baby Boomers on the ‘this place is paradise’ lie. You have seen the ads; come to Panama and buy your slice of Paradise. The infamous and well quoted International Living keeps touting certain locations as the best places to retire (they have relocation tours you see where they are making a lot of money). These headlines make me crazy because they are so untrue and so unfair and unfortunately, so legal. First of all there is no such thing as Panama being Paradise. I have lived in Panama. Panama is suffering from a serious draught right now and the coffee trees and the banana trees are suffering blight. Crime against expats is on the rise in certain areas; so much so that the local police have told expats to protect themselves. These tours where people want to show you the ‘real’ Costa Rica or the ‘real’ Panama are as bogus as the day is long. They are making, depending on how many people are a part of your tour, upwards of $1,000 a person on you to show you around. And they aren’t really showing you around. Or you aren’t asking the right questions. If you aren’t asking kick the tire questions you aren’t really being shown around. Ask them about legal documents and the fact that the one in Spanish is the only one that is legal. If you do not speak Spanish why would you enter into a legal agreement about buying property? And how do you know you have clear title to the property? There are tons of stories on the internet about expats not really owning the property they think they own mostly because they do no understand what that contract in Spanish says. How about asking them where the water supply comes from and where the water sewage plant is located (there isn’t one in Panama and the water comes from the mountains and flows into the ditch’s which get clogged with dirt; that is the water you will drink and cook with and wash with). Ask them about electricity outages and how often they happen. Ask them about scorpions and how to deal with them. Ask them about the constant fight against mold and mildew and I’m going to bet they tell you to get an air exchange machine for your house. Someone has something to sell everywhere! No one should be buying property in any foreign country until they have lived in that foreign country no less than 6 months. Pack a suitcase and move to whatever country you think is paradise and see if all the hype is true. Do the touring on your own. If you can’t travel the country on your own you shouldn’t be living in that country. If you don’t speak the language but you think doing these tours is the answer you are moving to someplace that you shouldn’t be living. Who is going to be around to help you when the tour ends? Expats in some of these areas are more crooked than the locals and you can’t trust many of them either. Do not fool yourself that many of these people will be your friends. Most of the expats we met while living in Panama are long gone now; in fact most of the expats who try to live in Paradise are gone within 3-5 years. These are the folks you need to chat with and ask them why they left. They will tell you. Compare their stories with those of these snake oil salesmen and then you will have a real picture of what it’s like to live in these places. Alcohol consumption is a common theme among the expats as well. For some reason because the cost of living is so low they move to these places to drink themselves into happiness. If drinking is not your favorite pastime rethink moving to a third world country. Panama, Costa Rica, Nicaragua and the rest are all third world countries. I don’t care if you can have granite counter tops and stainless steel appliances and hot water on demand. You are also going to have to live behind a gate; with iron bars on your windows; no maid to clean up after yourself because they will all rob from you; respiratory issues from the mold and mildew that you are not accustomed too and scorpions in the house; snakes and bugs on the front lawn to the point where you cannot walk through the grass; and wild dogs roaming the streets who tear through the garbage and leave a mess. Does that really sound like Paradise? The other snake oil pitch is how your family and friends back home will love coming to visit you every year. Back the truck up. Why on earth would you think that someone else is going to spend their vacation going to the same place over and over again just because you think you are living in paradise? This has been one of the largest realities for people when they realize that after the initial visit the generations after you want to go someplace else and so no one comes to visit. This is when people realize that they miss their families more than they want to live in Paradise and they leave. The rules still apply; if something looks too good to be true it usually is. This applies to living in Paradise as well. If like I said you can live in any of these countries for 6 months and really live in these countries without trying to change the locals and without trying to bring your home country with you; then more power to you. You have successfully learned to live in Paradise. But if you want to change the environment around you to suit you and your needs; if you want the locals to learn to be more like the people and workers back home (which means they show up on time and they are ready to work); if you want to live just like you did back home; why did you move? If you don’t want to learn their language, don’t expect them to learn yours. The world does not revolve around expats. So the next time you are approached by any of these snake oil salesmen ask them the tough questions before you spend your money on any of these tours they offer. You might be better off taking the whole family on a trip to Europe or someplace exotic. After all, isn’t spending time with family and good friends really the Paradise everyone is seeking after retirement? And as always I will say what I have said many times; if it was paradise, why are there always so many homes for sale? We have had some amazing travel adventures thus far as The 6 Monthers. We have been to four continents, over a dozen countries, we have met some special people and seen things of such beauty that it is hard to imagine that we could find anything to rival it and yet, as we have kept traveling we have seen more beauty in different places and wondered at what we will see next. One of these experiences came long before either of us was blogging. 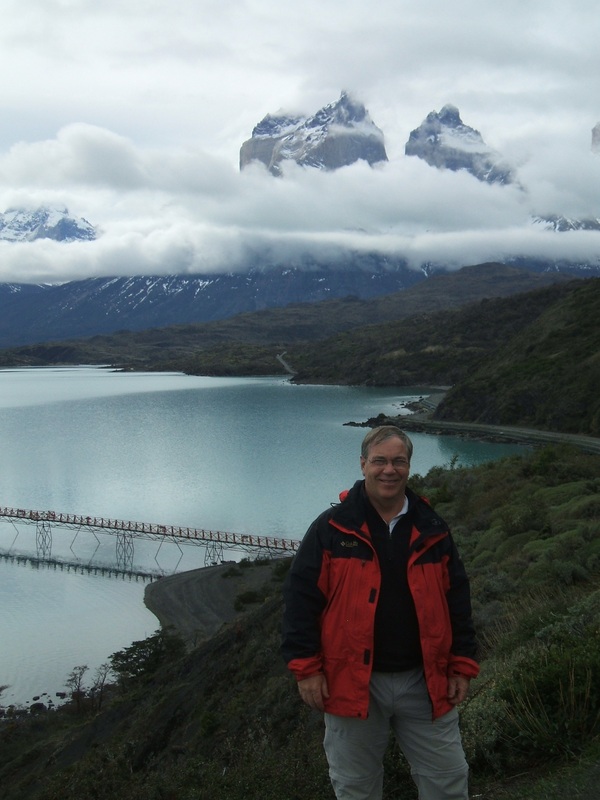 On a cold and dreary winter morning we took a magical trip to visit Glacier Grey in Torres del Paine National park in Chile. 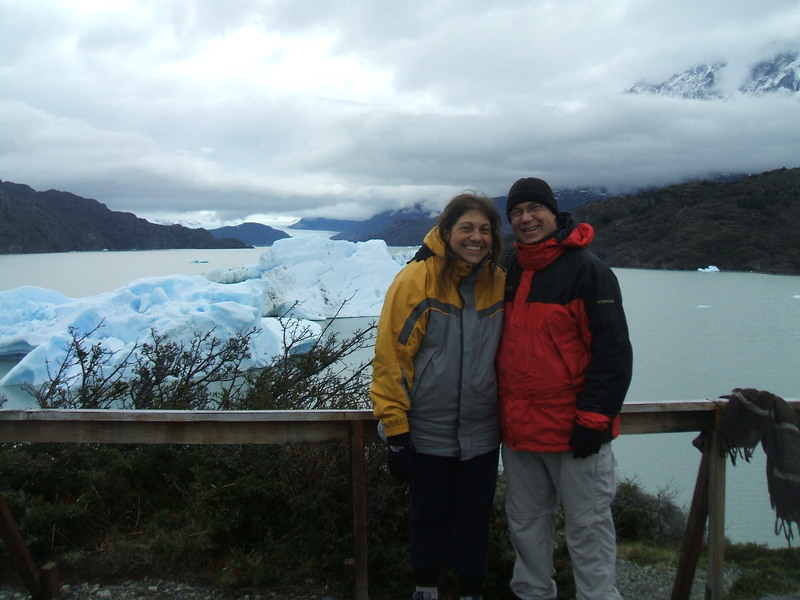 Getting to visit this region of Patagonia was one of Mike’s long time dreams and the vistas of the mountain peaks and the glaciers did not disappoint. However it wasn’t the park that holds the memory or the attraction that still resonates with us both these many years after our visit. Our tour guide that day told us that something magical awaited us down by the beach. He said it would be something that we would have a hard time explaining to others who were not with us and if I had known how true this statement was I would have had a video camera running so that I could have recorded the sound. Our group this day was composed of all adults so we trudged down to the beach front and wondered if looking at the smaller icebergs which had broken off from the main iceberg was the attraction our guide had told us about. As we stood at the water’s edge our guide told us to stand silently for a moment or two and to take it all in. It was then, while standing silently, that we heard what sounded like wind chimes; thousands and thousands of wind chimes. We began to look around. 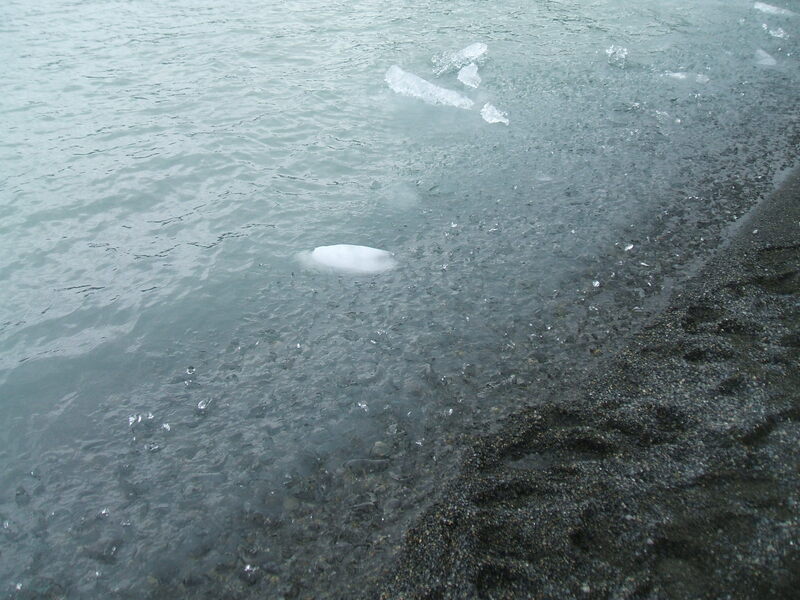 We were told to look down, into the water, and there it was, ice, tons and tons of ice lapping itself onto the beach sounding like the tinkling of ice in a giant glass. We were in awe. Our guide told us that many people come here with whiskey glasses in hand to scoop up some of the glacier ice and then they open a bottle of some brew and they drink their drink with ice that might be a million years old. Think about that for a second. 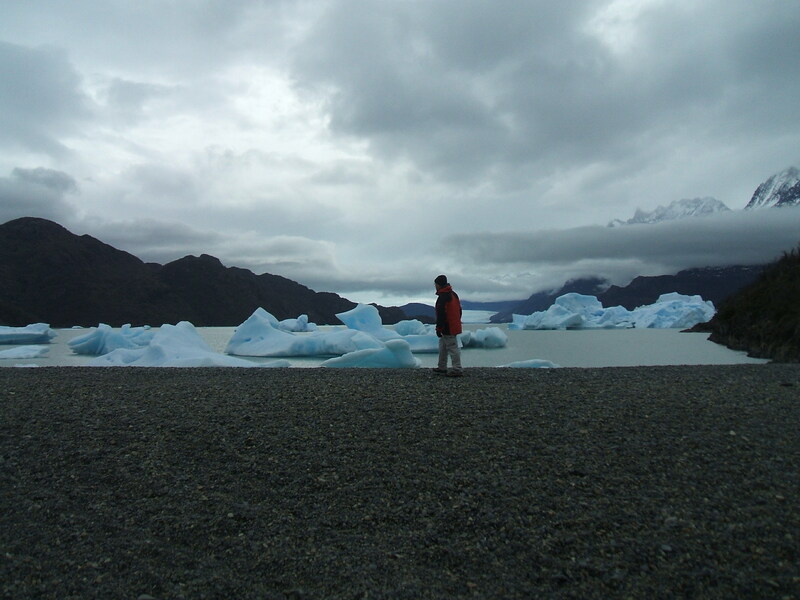 The ice we were looking at and hearing was broken from Glacier Grey; one of the largest and oldest glaciers on earth. Gives you pause doesn’t it? Since our visit to the park I had seen an article in the news where thieves actually drove to the beach site and tried to make off with tons and tons of the ice to sell in fancy drinks someplace. That didn’t go over well with the Chilean government and the culprits were apprehended. 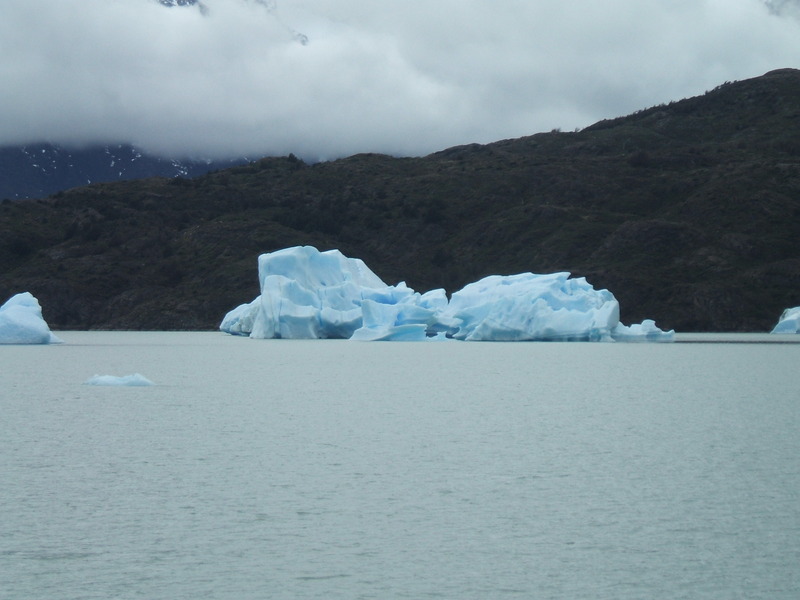 What triggered my walk down memory lane about the experience of the ice tinkling at Glacier Grey? Perhaps it was that winter is upon us here in Spain and at times the weather is cold; perhaps it is because the other day I passed a store that sold cheesy wind chimes; or better yet, it’s most likely because I walked the sand on the beach here in Torrevieja and as I listened to the sound of the waves hitting the beach I thought back to another amazing travel adventure we’ve had where we heard the ice from a million year old glacier hitting the beach, and I smiled. Perhaps we’ll have to return to Glacier Grey bay someday to record the sound. Yes, a picture is worth a thousand words, but in this instance a recording might be worth a thousand pictures.